On October 1st, in conjunction with the IMBA Take a Kid Mountain Biking Day, CORBA will be having a fun ride at Malibu Creek State Park at 9:00 am. This will be a ride followed by a barbecue. All ages are welcome! 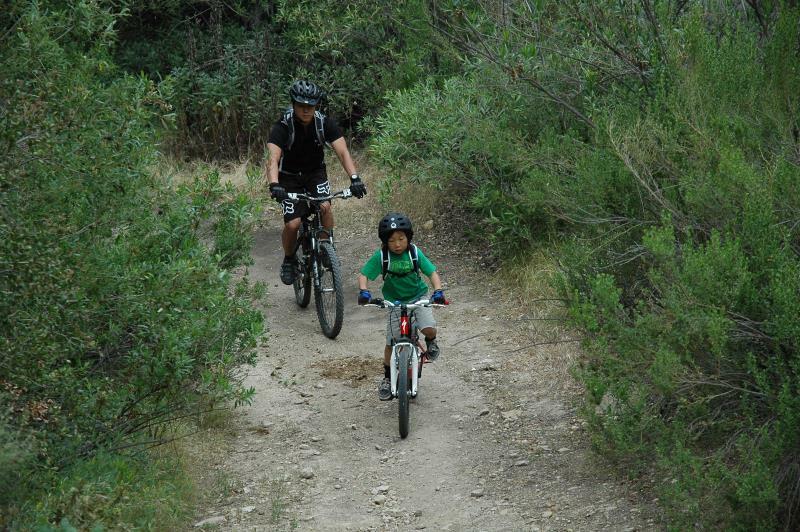 If the kids are too young to ride, feel free to bring a bike trailer or trail-a-bike and tow them along. 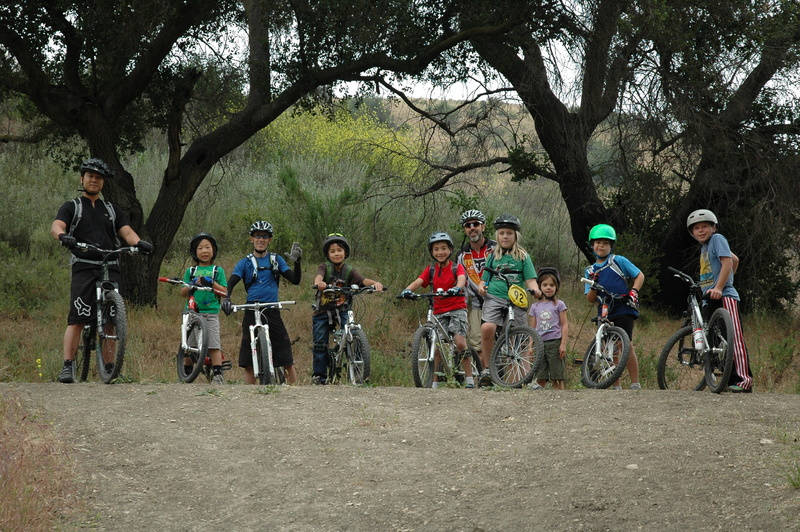 These can be your own kids, nieces, nephews, friends kids, neighbor kids… Kids must have their own bikes and helmets. 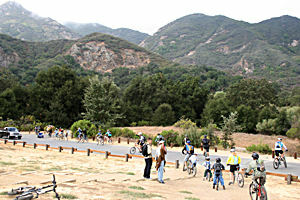 To get to Malibu Creek State Park, take the Ventura Freeway (101) to Calabasas, exit Las Virgenes Road/Malibu Canyon. Go south 3.5 miles. You will cross Mulholland Highway and go another 1/4 mile to the entrance to Malibu Creek State Park on the right. Meet at upper parking lot. 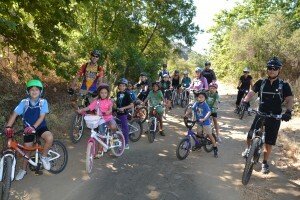 The CORBA Kids Club monthly ride was held Saturday June 4 at Point Mugu State Park/Sycamore Canyon. Despite forcasts for windy chilly weather, the marine layer kept it pleasantly calm and cool, and when the sun came out, everyone was happy to peel off a layer. 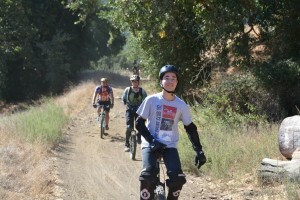 After reviewing trail etiquette, safety guidlines, and describing the upcoming water crossings, the riders started out on the main fire road. Along for the ride were 7 kids (Josiah, Julia, William, RJ, Elliot, Ethan, and Nolan and 6 adults (Larry, John, Joy, Dave and Dave, on bikes and Kat on foot). The first water crossing allowed for an easy introduction for those who were comfortable enough to get a little wet. There was a shallow section to the right, and everyone who rode it glided through and made it up the hill on the other side. 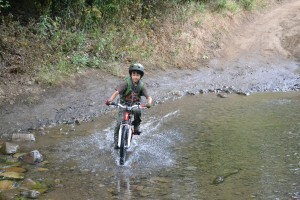 The water crossings provided more teaching and rest opportunities as the kids encouraged each other along the way. When we reached the 3rd water crossing, we had to wait for a family of Mallard ducks to pass before putting our wheels back in the water. Several varieties of wildflowers dotted the way, as did the poison oak. Luckily the trail was wide, and it was easy to avoid. Kat pointed out purple and black sage, white yarrow, and golden yarrow to Julia and Joy on the way back. After the ride, the kids piled into Dave’s truck for snacks and water. You can see all the pictures from this ride in our June photo gallery. Next ride will be at Malibu Creek State Park on Saturday July 2 from 9 to noon. Hope you can join us! Please register online to let us know you’ll be coming. 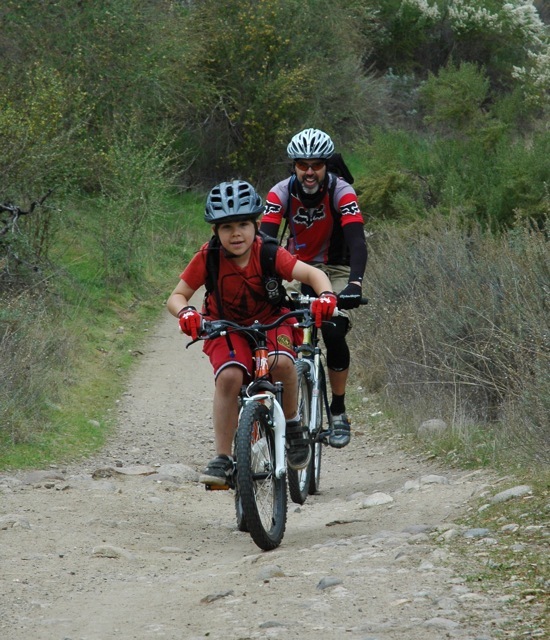 Organized parent/children mountain bike ride to build confidence, promote health and wellness, share knowledge of trails and riding techniques, teach respect for each other and the environment; inspire the next generation of mountain bikers and CORBA volunteers! Meet at Malibu Creek State Park lower parking lot at 9 a.m. Kids must have their own bikes and helmets. After Larry reviewed safety guidelines and trail etiquette, we left the Cheeseboro trailhead with one Dave in the lead and another Dave on sweep. 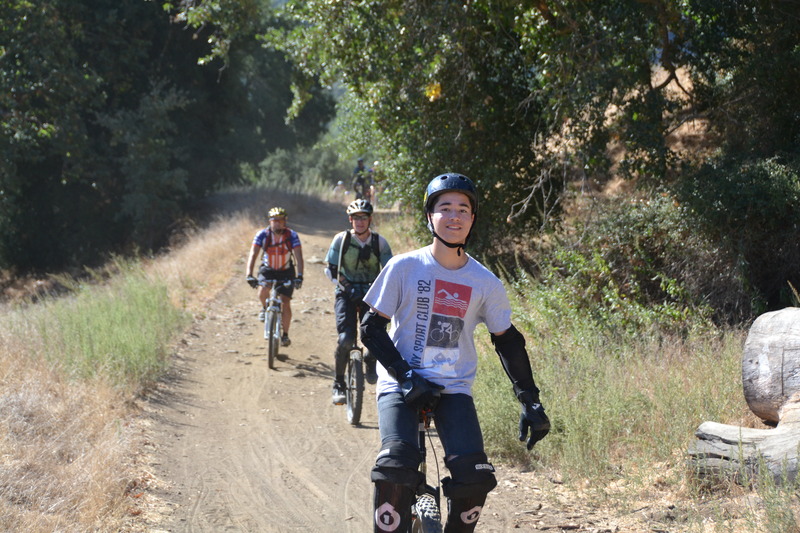 Most of the gang took the short single track option and pedaled up to the picnic tables for our first break. After some drinks, snacks, and tomfoolery, we did some hill climbing practice on the short but steep hill behind the picnic tables. Hats off to William, the only kid who cleared the climb! 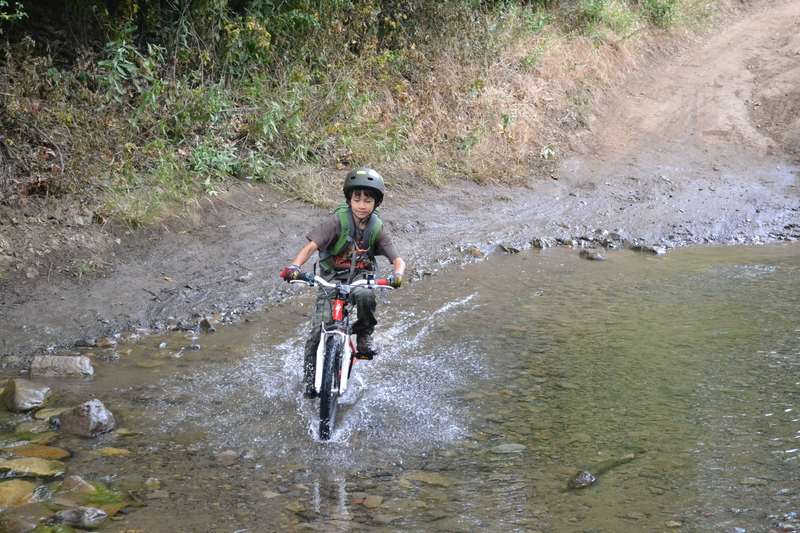 After the break, we rode on past “The Bees” and to the up-and-over at the sulphur creek. Entry to the creek was wet and muddy and very, very smelly! Fortunately, the tree that had blocked the trail during our April ride was all clear and we were able to continue. From there, we rode up to one of the first rock wall areas before turning back. After another break, drinks, and snacks, the crew arrived back at the parking lot, completing a ride of about 6 ½ miles. 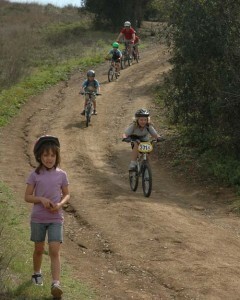 The kids did great on the ride and we were all proud of their effort and skills on the trail. The kids celebrated with more snacks and play. And as usual, everyone was having such a good time, it was hard to break up the party. You can view our photo gallery of the ride. We are all looking forward to the next CORBA kids ride in June and hope you and yours will join in on the fun. The next ride will take place at Point Magu State Park, Saturday June 4 from 9 to noon. David agreed to be sweeper with Larry riding ahead with son Elliot on a tow-a-bike. The first stop was the picnic tables on the main trail, where everybody rested, snacked, and Kat pointed out some native plants. Wildflowers we saw along the trail included fiddlenecks, wild hyacinth, and California Peony. T he plan to ride to “The Rock” or “The Bees,” (as it is commonly known) didn’t materialize due to a fallen tree that completely blocked the main trail about two and a half miles in. We left our bikes, hiked up to the tree and several of the kids climbed aboard it for another rest stop. We decided to make this our turn-around point. Before heading back, we reminded everyone to control their speed since the majority of the trail would be downhill. We met a family of riders at the parking lot using a trail-a-bike, and we gave them one of our fliers. Next ride is scheduled for Cheeseboro Canyon Saturday May 7th from 9 to noon. Look for the Gray Honda minivan with the CORBA/IMBA stickers; hope to see you there! 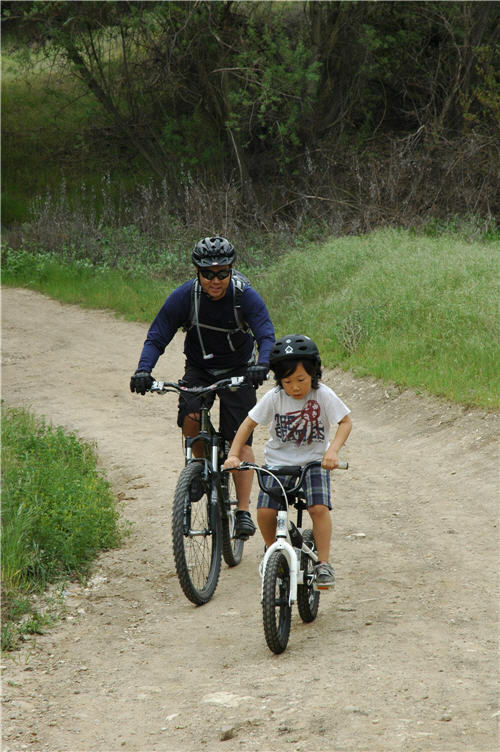 Click on CORBA’s calendar for upcoming dates, which include February 5 at San Vicente Mountain Park (Nike Tower) in Encino, March 5 at Malibu Creek State Park in Calabasas, and April 2 at Cheeseboro Canyon Park in Agoura Hills. For info contact kidsclub@corbamtb.com.